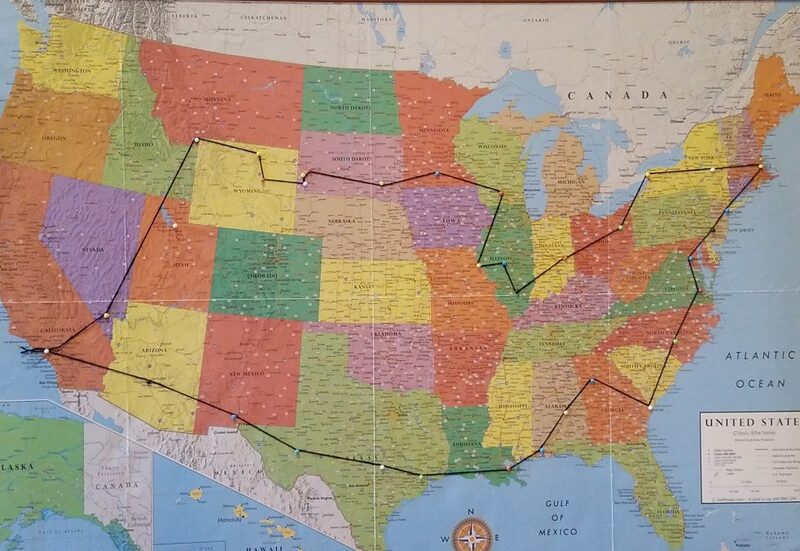 American History Roadtrip – Follow the adventure! After 1900 miles in 5 days we made it home mid-day on Friday. We are so happy to be back (but tired). and then I went over afterward. The kids had plenty of time to talk and play and I had a wonderful time catching up with the parents and some teachers. Again, a huge thank you to Michael for allowing us this adventure, to Eli for his patience and understanding, and to our other family members and friends who helped with the day to day, especially giving Eli some special care and attention while we were away. Also a special thank you to all of the family and friends who hosted us while we were on the road. I cannot image what it would have been like to do this trip having no contact with familiar faces. It definitely made a huge difference to spend time with family and friends along the way. Until the next adventure . . .
From Montgomery we drove to Mobile or rather to a small town just outside Mobile, Spanish Fort, and spent the night at a motel. We were up early for our drive to New Orleans, but stopped in a small town in Mississippi, Moss Landing, to do our laundry. Our one hour in Mississippi definitely provided some insight into life there. We arrived at our hotel in New Orleans where we were meeting Michael, Eli and Grandma Mary and Grandpa Shelly. We referred to this weekend as the Grand Finale of our trip. We were so excited to be with family! Our goal for the weekend was to eat our way through the city. On Friday we had reservations to visit the Whitney Plantation which just opened a couple years ago. The plantation has been restored and designed as a tribute to the enslaved. Our tour guide, Courtney, was a descendant of people enslaved at the Whitney Plantation. She provided an eye opening and thought provoking presentation of life on the plantation from the perspective of the enslaved. Courtney and I had an insightful discussion about slavery. While we had been at the Civil War re-enactment one of the players had explained to Shayna that the Civil War was not really about slavery but rather taxes. He made two comments that stood out to me, one, that 95% of slaves in the south were content with their Master’s, that abusive Master’s were the exception, and second, he argued that if the war had been about slavery why had slaves fought for the South? So, I asked Courtney for her reaction to those comments. She basically explained that those are not unusual arguments heard in the South. However, she argued, slavery is inhumane regardless of how “nice” or cruel slave owners were and that slaves were often forced to fight in the war in place of or in addition to their owners. The Whitney Plantation is a “must see” if you are ever in New Orleans. It provides an honest and uncensored history of plantation life. As well, we talked about what happened once the slaves were freed after the war. Some families remained working for plantation owners up to the 1970s, which again provided some insight into the current struggles still faced by African Americans in our society. We had lunch a few miles down the street at a local restaurant which has mostly long tables covered with plastic for crab/shrimp/crawfish boils. Unfortunately it is not crawfish season so that option was out. We could have had some fresh soft shelled crabs but I was too hungry to mess with all that. Shayna and Eli did try some alligator. We all ate light so that we would be hungry for our dinner at one of the New Orleans trendy restaurants where we enjoyed oysters and etouffee. Day 66: We had a dream . . .
Wednesday was one of the last days for focusing on our America history agenda. Still in Montgomery, we spent the day visiting more Civil Rights venues. This day was definitely one of the highlights of our trip. We started the day at the Rosa Parks Museum. You time travel with Rosa Parks back to the early 1800’s and then progressively forward in time (the bus vibrates with each time travel) with Rosa Parks narrating the significance of the time period and how it lead up to the bus boycott. Once you arrive to 1955, you proceed to the other side of the museum where you move from room to room, each having another creative method of presenting what happened the day Rosa Parks refused to give up her seat through the year that the bus boycott lasted. Once again, we felt like we left the museum with a thorough understanding of not only the events that happened, but also the political and social climate of the time period. From there we walked over to the Dexter Avenue Baptist church where Martin Luther King was head pastor for 6 years. We were greeted by the tour guide, Wanda, a current church member, who immediately gave us hugs. She is one of those people who exudes an infectious energy. We hung out with her for a few minutes and she asked us about our travels while we waited for the Road Scholar group that was scheduled for the tour. and then a chance to sit at MLK’s desk. The whole affair was not so much a tour as it was an experience and only because of Wanda’s passion and energy. We were so inspired by Wanda’s “tour” that we decided to walk to the far end of town to see the home where MLK and his family lived. Turns out it is a home that is owned by the church and all of the past pastor’s of the church had lived there. This tour was just as much about MLK as it was about the history of the church itself. The tour guide was a church member who had been a member when MLK was there. So, it was very exciting to hear about her first hand experiences. The most meaningful part of the tour was when we were all standing in the kitchen of the house and she played an audio recording of one of MLK’s sermons when he talked about sitting in that kitchen struggling with the decision to become an official leader of the MIA (Montgomery Improvement Association) which lead the Montgomery bus boycott and other Civil Rights activities. It was getting late and we still had to drive to Mobile. But on our way back to our car (just a little out of the way) was the Freedom Riders Museum which is housed in the original Grey Hound bus station (original doors and walls). It is a just a one room museum. We arrived about 10 minute before it closed, and we were the only people there, so the staff person offered to give us a quick version of her tour. So glad she did because Shayna was too tired to read the displays. By the end of the “tour” Shayna said it was one of her favorites. It was another opportunity to learn in detail about another one of the major events of the Civil Rights era. As we thanked the guide and left the bus station/museum Shayna and I agreed that this day had really been the perfect culmination of our historical journey. We have spent the last 10 weeks traveling around the country learning about Native American history, the Revolutionary War, the Civil War and Civil Rights. While we had dreamed about what the trip would be like, we walked (or rather drove) into it with few expectations or pre-conceived ideas which left us open to all of the experiences we encountered. I honestly never imagined how well it all flowed together, how the multiple tours, discussions and experiences coincided and complimented each other, not to mention the incredible amount that we learned along the way. For Shayna, these experiences will provide images and bring to life the history she learns about in school over the next few years. And maybe more importantly, provides some perspective and understanding of these historical topics that she would not otherwise be exposed to in the classroom. After a nice weekend of hanging with family in Jasper, Georgia on Sunday we drove down to Montgomery, Alabama which was our base for the next few days. We were staying downtown and it was super quiet on Sunday night, but turns out their downtown just isn’t that busy or crowded (by California standards) at any time. Montgomery was a focal point of Civil Rights activities in the 1950’s and 1960’s, so there was a lot to see. We started on Monday driving the 50 miles to Selma, Alabama to explore the now National Historic Trail of the Selma to Montgomery March. We started in Selma at the National Park’s Selma Interpretive Center. We started with watching a video on the 3rd floor of the building (did I mention before there is always a video?). From the video room you can see the Edmund Pettus Bridge out the window. That floor also had an exhibit of photographs from the 50 year anniversary Selma Montgomery March and portraits of some of the key figureheads who attended including Rev. William Barber, who gave that amazing speech at the 2016 DNC. As you move down to the second and first floors there are various exhibits describing the key players and events leading up to and what happened the weeks of the Selma Montgomery March. (There was one video of a woman explaining that the Marchers were paid to show up and the March was really just a big party – sound familiar?) It provided a detailed explanation of that time period, so we left feeling well versed in the events of those days. and a very Southern looking cemetery (lots of confederate flags). We did not feel too comfortable walking around so just took some quick pics and moved on. We drove over the Edmund Pettus Bridge and just at the end opposite from Selma is a small park that was designed and dedicated as the Bridge to Freedom Memorial Park. We parked and looked at a couple monuments placed there. Then we saw that there was a woodsy park that had a wooden pathway through it. We did not feel comfortable walking too far, it was a bit eerie, so just walked the closest wooden walkway that went from the entrance, in, then circled back a bit under the bridge back to the entrance. I have to say as we walked under the bridge I stopped, looked up, and I could actually feel the energy of the events that had occurred there. I honestly was not even thinking that deeply about it, but it just hit me as we moved closer to the bridge. It was an unexpected and intense feeling. Shayna and I just kind of looked at each other and remarked on the impact of being there. Another surreal moment. we learned that people from the area who participated or supported the marchers were fired from their jobs and lost their homes. The location of this Interpretive Center is the location that in 1965 became a tent city for the families that had lost their homes and employment. The amount of violence and discrimination that was happening in this area is incredibly scary and it is disheartening that is was happening such a short time ago. I was explaining to Shayna that even though 50 years seems like a long time, in terms of social change, it is not such a long time. Not only does it feel quite recent in terms of the history we have been studying, it makes sense why we are still encountering so much racism and discrimination today. People who were a part of that history are still alive and their shared experiences and beliefs persist. We arrived back to Montgomery with enough time to go visit the Civil Rights Memorial and Center which is run by the Southern Poverty Law Center. This memorial was also designed by Maya Lin, the woman who designed the Vietnam Memorial. Shayna and I signed a pledge of tolerance and added our names to the Wall of Tolerance. We are staying with Michael’s sister’s family in Jasper, GA which is about an hour north of Atlanta. Jasper is a small mountain town of about 3,000 people in the county of Pickens, population 28,000. They live in the mountains by a lake, about 5 miles from town. Being that we are in the mountains we decided to do some hiking. About 25 minutes from here (everything is at least 25 minutes from here) is Apicalola State Park which is known for Apicalola Falls, the tallest waterfall in Georgia. It also turns out to be the southern end of the Appalachian Trail, which was kinda cool even though we were not actually on the trail. But it definitely had me contemplating one of the my other dream goals – to walk the John Muir Trail from Yosemite to Whitney. If anyone is interested in joining me, I am looking for a hiking buddy for that adventure! While we have done LOTS of walking this trip, we have not done much strenuous activity, so the 2 mile hike up and around the falls was a perfect challenge to our physical status. It was beautiful to be in the mountains. Afterward, we wandered over to a town called Dahlonega, which Shayna remembered from California history studies last year, as the first gold mining town in the country (impressive!). It is also a mountain town, mostly catering to tourists. We had lunch and walked around the cute historical town checking out the shops. Even though we are a bit off of our itinerary and road map, we opted to say around here a couple extra days so Shayna and Alexis could have some quality cousin time together. They definitely had that with our evening event, a Halloween hayride. On Wednesday we headed back to Atlanta again. We started the day with lunch at True Food Kitchen in Buckhead (the Beverly Hills of Atlanta) to have lunch with our friend Sherrie, who moved here last December. It was fun to see her and catch up and the food was awesome! Like being home! Then we drove over to the MLK National Historic Site. Unfortunately it is being renovated so things were limited. We had a chance to see MLK’s boyhood home and neighborhood which is a national park preserved historical site. We would have had to wait 2 hours for the tour of his house, so we eavesdropped on the tour outside the house for a few minutes, but did not get to go in. A block down from the historical block there is a center which has rooms dedicated to artifacts of Martin Luther King and Coretta Scott King, Ghandi and Rosa Parks. We also had a chance to visit the original (and beautiful) Ebenezer Baptist Church which is where MLK was a preacher. It now preserved as a museum. (They have built a new Ebenezer Baptist Church across the street.) When you walk into the nave they have a recording of Martin Luther King’s Drum Major speech playing. It is quite an experience to sit in the silent room hearing his booming voice. Afterward we headed back home, hoping to be ahead of the Atlanta traffic, which is just as bad a LA! Day 58: This day is brought to you by the letter C! We started the day at the Center for Civil and Human Rights. Going through the exhibit was like taking a walk though civil rights history. The displays were set up in chronological order of the significant events from the early 50’s to the late 60’s. It was a perfect summary of of events for Alexis and Shayna to learn an overview of what happened in the south during the civil rights era. The one hands-on exhibit was a lunch counter. You sit at the counter, put on a set of headphones, then put your hands on the counter which starts a recording and a timer. The recording replicates the harassment experienced by the participants of the lunch counter sit-ins, and it measure how long you can tolerate it. It was very difficult for Alexis who lasted about 20 seconds. Shayna was not allowed to do it without my permission and the recording was a bit too violent for her in my opinion. The exhibit included a biography of many of the key players during the civil rights events. We were able to find multiple pictures and descriptions of John Lewis, which connects to our seeing him while we were in the House gallery in Washington. The upper floor of the Center holds a human rights exhibit which provided a overview of the meaning of human rights, summaries of some of the human rights issues people face today and biographies of key players in the human rights efforts from the past and present. From there our day got a bit less educational. We went to the World of Coca Cola which is right next door to the Center for Civil and Human Rights. It is interesting if you are a Coca Cola fan or thirsty because you receive free drinks when you walk in, and unlimited tastings in the tasting room. which was not as big as I had imagined, to get to CNN where we took the CNN tour. It was interesting but not as immersive into the world of news production as I was hoping.